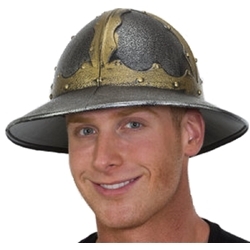 The Crusader Helmet is available in One Size Fits Most Adults. This silver and gold helmet is well suited as part of a historical costume. Pair with any of our crusader or conquistador accessories to complete a medieval costume for a Renaissance Faire or for Halloween!